Adam is a Manager working in our Corporate Finance team. After obtaining his M.A. 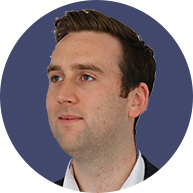 (Hons) in Economics and Accounting from the University of Edinburgh in 2012, Adam joined the PwC Assurance team in Edinburgh, qualifying as a Chartered Accountant with ICAS in 2015. On qualification Adam moved to PwC London, joining the Transaction Services team where he dealt with a wide range of clients in numerous sectors, but with a particular focus on the Technology, Media and Retail sectors. Adam has professional experience with a wide variety of companies, ranging from growth technology businesses to listed corporates and he has previously been involved in deals ranging from £20m to £1.8bn in value. Adam joined the HMT Due Diligence team in June 2018 and recently moved to our Corporate Finance department. Adam lives in London and in his spare time, he enjoys going to live music concerts, visiting the vast amount of restaurants London has to offer, shooting and spending time outdoors on the family farm. Adam is a true Scottish gentleman who knows how to play the bagpipes but doesn’t!